Check out our calendar of local and international trips. Any species, location or season; we can make it happen. Download our fishing trip calendar and you’re one step closer to bending a rod on your dream. Mavungana Flyfishing is one of the oldest and most well-known names in the flyfishing industry in South Africa. With the country’s largest specialist flyfishing outfitters in Dullstroom, as well as one of the country’s most well-equipped fly shop in Johannesburg. Enjoy a world-class selection of gear, as well as knowledgeable staff at our branches. Choose from a selection of Mavungana Flyfishing’s trout waters countrywide or be guided on our renowned private trophy waters. Johannesburg is a new look historical establishment that carries an unsurpassed range of tackle and accessories. Mavungana Flyfishing also offers expert one-on-one tuition and guiding from Spey casting to small stream techniques, by internationally certified instructors. Mavungana Flyfishing has spent over 25 years building relationships with the local farm and land owners to bring you the best waters available, we own and manage a variety of premium trout waters in Dullstroom to cater to various skill levels and expectations. Mavungana Flyfishing offers a world class selection of gear and tackle from around the world, to give you the best fishing experience for your next trip. We stock internationally acclaimed brands such as Patagonia, Columbia, Sage, Orvis, Hatch, SIMMS, Scott and much more, in the Johannesburg and Dullstroom branches. With Mavungana Flyfishing having guided, managed and fished some of the world’s finest flyfishing destinations and having the owners as close friends we can offer the best fishing in the world at the prime time of the year, taking care of all the travel logistics, equipment requirements while guaranteeing a fun group dynamic lead by an experienced Mavunagana Flyfishing host. South Africa has a huge diversity of flyfishing from trout in high altitude regions, from the Western Cape streams, to Lesotho and the Natal Midlands through to Dullstroom. Tigerfish on the Pongola. 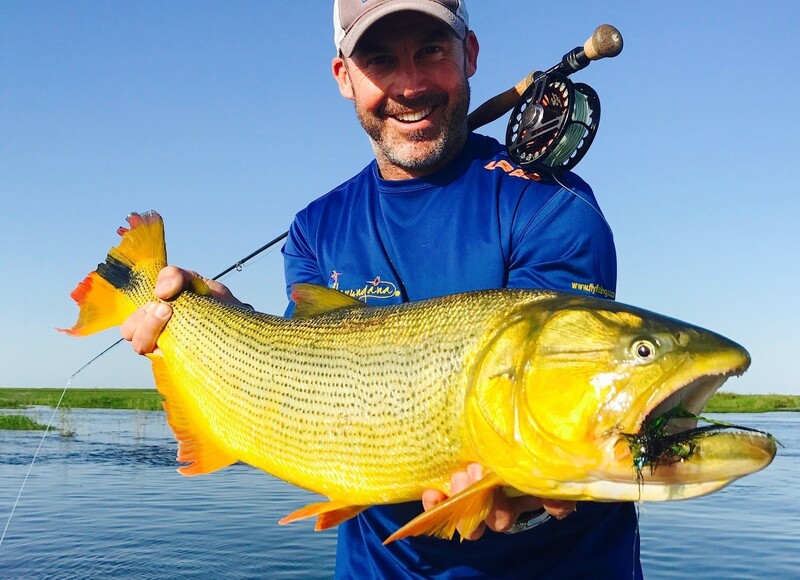 Yellowfish on the Vaal and Orange river system as well as the gin-clear Sterkfontein Dam. Our challenging coastal fishing from the prized Grunter on fly to the Kingfish of Kosi Bay. You can do the hard yards yourself or take the pleasurable shortcut with us. Mavungana Flyfishing offers a wide variety of services, including casting lessons by our internationally certified and experienced guides. Setup and management of fishing camps and lodges as well as the training of flyfishing guides. We also offer feasibility studies on potential new trout fisheries and manage a number of trout waters in Mpumalanga. Would you want to be anywhere else? Having seen her before on a previous drift at one of our lunch spots we were ready this time. As expected she popped up onto a submerged ledge just like she had done before. With less than a foot of flyline out the tip of the rod Gavin simply lobbed the fly at her. Having a fish like this eat at our feet and tear off for the depths while you’re still trying to swallow your lunch just shows what a wild place this really is.